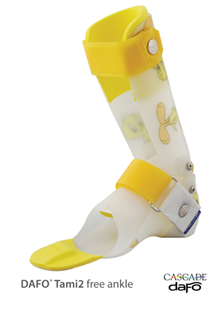 Cascade DAFO introduced the first Dynamic Ankle Foot Orthosis (DAFO) more than 25 years ago. Cascade Dafo's products are primarily geared toward pediatric patients, most of whom have neuromuscular challenges, but many adults also benefit from their innovative design concepts. The DAFO 9 is an adjustable stretching-positioning brace. Calf muscles and tendons are gently stretched to increase range of motion while maintaining foot and ankle alignment. The DAFO 9 may be used for limited daytime use and/or as part of a night-stretching program. The stretching straps of the articulated proximial section allow positional adjustment in order to help gain or maintain ankle range. The elastic sections of the stretching straps provide a more effective stretch. The DAFO 9 has superior hindfoot and forefoot control, promoting proper foot positioning. The soft foam liner is ideal for patients with challenging foot anatomy, difficult-to-correct feet, or those prone to pressure points and irritation. Ideal for active ambulators who would benefit from additional medial-lateral support due to strong excess pronation or supination. For patients having trouble with drop foot during swing phase, the design can include dorsi-assist joints. 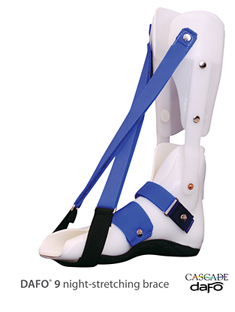 Posterior upright features a no-stop trimline to allow a natural free ankle motion (also available with a PF block). Reduced outer frame trimlines make shoes fit easier. Ideal for active ambulators with a tendency toward excessive plantarflexion and knee hyperextension who would benefit from additional medial-lateral support, with the option to add a dorsi-assist hinge. Posterior upright features a standard PF stop block; an adjustable PF stop block is optional. 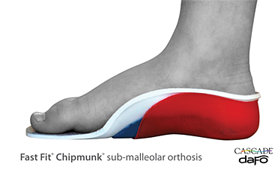 The Chipmunk's ortho-engineered solution is a step forward in comfortable realignment and maximum stability of the moderately-pronated pediatric foot. Its advanced design offers separate internal alignment and external stability—allowing each of these components to function well without compromise. For such a low profile, this sub-malleolar solution provides an unprecedented degree of support. "Multiple Presentations & Therapy Goals"
Schwartz, Vicki and Sheldon, Loretta. Dafo Dynamics, Winter 2010. Meet Austin. A sharp-dressed little man with an impressive vocabulary and a vivacious personality, this six-year-old is one of our favorite patients. Born prematurely at 27 1/2 weeks, Austin suffered a grade III intraventricular hemorrhage three days after birth which required placement of a ventroperitoneal shunt and, later, a diagnosis of spastic diplegia. Never without his trademark grin, Austin is a highly-motivated kiddo with an unfailing determination to succeed. Austin's case is a prime example of how external circumstances can play a critical role in the brace selection process. www.dafodynamics.com/winter2010_casestudy/case-study-multiple-presentations-therapy-goals.html. "Evolution of Foot Orthotics—part 2: Research Reshapes Long-Standing Theory"
"The Influence of Foot Orthoses on the Function of a Child with Developmental Delay"
"The Effects of Foot Orthoses on Gait in New Walkers with Down Syndrome"
"Dynamic Foot Orthosis and Motor Skills of Delayed Children"
"The Effect of Gross Motor Therapy and Orthotic Intervention in Children with Hypotonia and Flexible Flatfeet"
"The Effect of Hinged Ankle-Foot Orthosis on Gait and Energy Expenditure in Spastic Hemipegic Cerebral Palsy"
Balaban B, Yasar E, Dal U, Yazicioglu K, Mohur H, Kalvon TA. Disability and Rehabilitation. 2007; 29(2):139-44. "The Effect of Dynamic Ankle Foot Orthoses on Function in Children with Cerebral Palsy"
Immediate, significant improvements in crawling/kneeling, standing, walking/running, jumping functions of young CP patients who are independent walkers. Free PF with pronation-supination control improved gross motor skills. "Effect of Hinged Ankle-Foot Orthoses on Standing Balance Control in Children with Bilateral Spastic Cerebral Palsy"
Rha DW, Kim DJ, Park ES. Yonsei Medical Journal.2010 Sept 1; 51(5):746-52. "Stair Locomotion in Children with Spastic Hemiplegia: the Impact of Three Different Ankle Foot Orthosis (AFOs) Configurations"
John Izak, CPO, and partner in Orthologix, Inc., specializes in pediatric orthotics and works with children's specialized hospitals and facilities throughout Pennsylvania and the Delaware Valley. He has developed unique bracing applications, which have enabled positive outcomes for even the most difficult cases. As an educator, Izak provides ongoing seminars to allied health-care professionals on advancements in pediatric orthotics and participates in a variety of research projects. Izak travels to South America and the Middle East frequently to provide much needed orthotic care as well as education and training. A 1986 graduate of Temple University, Izak began his career as a recreational therapist at Abington Hospital. 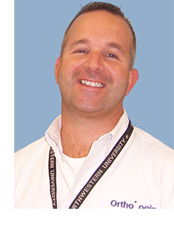 He attended Northwestern University School of Medicine where he studied orthotics and prosthetics and received his certification from the American Board for Certification in Orthotics, Prosthetics, and Pedorthics in 1996. In addition to his clinical work, Izak lectures and teaches at facilities throughout Pennsylvania and New Jersey. He is the volunteer Fire Chief for the Nottingham Fire Department in Bucks County, Pa.
Friday, March 22, 8:30 a.m. – 3 p.m. This one-day workshop, open to pediatric therapists, provides an overview of the Cascade Dafo system of pediatric bracing. Discussion will include common gait deviations in the pediatric population and the range of lower extremity bracing solutions available for consideration. Through a combination of lecture, patient videos, hands-on activities, and group discussion, participants will gain an understanding of how to effectively utilize a DAFO® (Dynamic Ankle Foot Orthosis) to improve patient outcome. Cidny Fox, CPO, FAAOP Cidny has a B.A. from the University of Washington and has specialized in pediatric orthotic work since 1986. She works at Orthotic Solutions, LLC in Fairfax, Virginia, and has been teaching for Cascade Dafo since 1994. A highly respected practitioner, Cidny maintains exacting standards and a wealth of knowledge that greatly benefit her patients and students alike. CEUs available — six classroom hours for Physical Therapists. Lunch provided. Click here for PDF of registration form and workshop information. Good news for your patients. The Treasury Department has ruled that prosthetic and orthotic devices, including therapeutic shoes, are exempted from the 2.3 percent medical device tax under the retail exemption provided in the Affordable Care Act. AOPA had several specific meetings and consultations with IRS and Treasury beginning nearly two years ago explaining why O&P devices were eligible for this retail exemption. AOPA also was successful that this retail exemption should apply to the manufacturers of O&P components because that tax "would just be shifted higher up the distribution chain," – meaning the patient. This is a dramatically important and favorable outcome for O&P in this final rule. It is clear that companies that manufacture components that are used by a patient care facility provider to fabricate an exempt O&P device (under the safe harbor rule) are also exempt. What this means for patients is that all custom-made orthotic and prosthetic devices will not cost an additional 2.3 percent to build. This will keep patient co-pay, deductibles, and cost at the same current rate (per your insurance company). Please feel free to submit your questions on the Cascade DAFO® as well as any other issue you would like addressed.